We like that LifeShield monitoring packages include free equipment and practical features, and we’re particularly excited to see that LifeShield gives customers mobile access with its lowest-tier package. The company’s biggest downsides are its negative customer service reputation and lack of home automation features. Wouldn’t it be nice to protect your home without emptying your savings account to pay for expensive equipment? LifeShield might be able to help with that. When you sign up for home security monitoring from LifeShield, you get a base set of equipment for free. Free equipment is a great perk—but what about the rest of LifeShield’s offerings? Read our review to find out what the company does well, how it could improve, and whether or not we’d recommend LifeShield to the average consumer. One of the biggest benefits of choosing LifeShield is that you get free equipment when you sign up for a monitoring package. But free equipment isn’t the only thing we like about LifeShield. The company does a lot of other things right. LifeShield is transparent about packages, features, and prices, which makes it easy to research your options. You get mobile access and control with the base monitoring package. Most other companies in the home security industry don’t give you mobile access unless you pay for the second- or third-level packages. You get some video capabilities with the middle-tier monitoring plan. Competitors usually don’t include video until you pay for the highest-priced package. LifeShield systems use cellular monitoring—which is the most secure option. But you can also still get landline and broadband protection with your system. While LifeShield gets a lot right, there are some ways it could improve. Home automation: LifeShield doesn’t offer any home automation equipment and doesn’t pair with any third-party smart home devices. This puts LifeShield behind a lot of the competition. For example, Vivint’s higher-tier package is about $50 a month and includes lots of home automation features. LifeShield’s highest-tier package is also about $50, but it doesn’t come with any home automation. Equipment selection: You can get LifeShield equipment for free, but you don’t have a lot of equipment to choose from. Most other home security companies offer a wider variety of home security equipment—things like freeze sensors and carbon monoxide (CO) detectors—but LifeShield offers only the basics. You can get a siren detector that will trigger an alert if your existing smoke or CO detector goes off, but you can’t actually get a smoke/CO detector that integrates with LifeShield’s system. Customer service: Online reviews should be taken with a grain of salt, but we should point out that most reviews of LifeShield are negative, and the company has a D- rating from the Better Business Bureau. While we’d caution against letting angry strangers on the internet have a huge impact on your purchasing decisions, the high volume of negative reviews is a bit worrying. These package prices are in line with the rest of the industry, but they’re a little closer toward the high end of the price range. LifeShield doesn’t offer nearly as much equipment as other companies, but you do get your equipment for free with a monitoring plan. If you need only the basics, LifeShield’s got you covered. We got to try out some of LifeShield’s equipment for ourselves—the first thing we noticed was that while it was easy to set up, it didn’t have as many helpful instructions as other DIY systems. For example, Blink’s smartphone app walks you through the entire setup process with photos and quick videos. LifeShield gives some guidance in the app but without that level of detail. LifeShield’s camera is extremely easy to attach to the stand and position at almost any angle you’d like, but it does have to be plugged into a power source, so your placement options are limited. The smoke/carbon monoxide siren detector was also easy to set up. Since it’s a peel-and-stick device, you can put it pretty much anywhere without drilling holes or hooking up any wiring. Plus, it’s easy to replace the batteries—a relief if you’ve ever struggled with fussy battery covers. While the equipment selection is limited, we’re pretty happy with the equipment LifeShield does offer. It’s simple to set up and use, and the tablet’s interface makes it easy to manage all the devices you hook up. We had a tough time tracking down positive reviews of LifeShield. The positive reviews we found focused on positive experiences with customer support. Unfortunately, the bulk of the reviews we found were negative, and talked about difficulty with equipment and poor customer service. 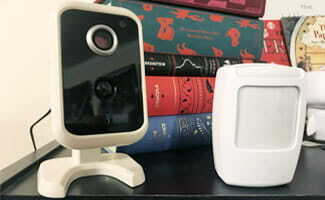 Do we recommend LifeShield Home Security? LifeShield gets a lot right—if you can’t pay much up front for equipment and you want mobile access with the base-level plan, it might be a good choice.We’re hesitant to recommend the higher-tier plans because you can get more features, including home automation, from other companies for the same amount of money. And a lot of those other companies have a larger equipment selection and 24/7 customer support. If you need just the basics, LifeShield might suit your needs—but if you’d like to learn more about other options, check our post about the best home security systems. Do you have any experience with LifeShield Home Security? Please share your stories in the comments below!